Click here for a PDF of this flyer. 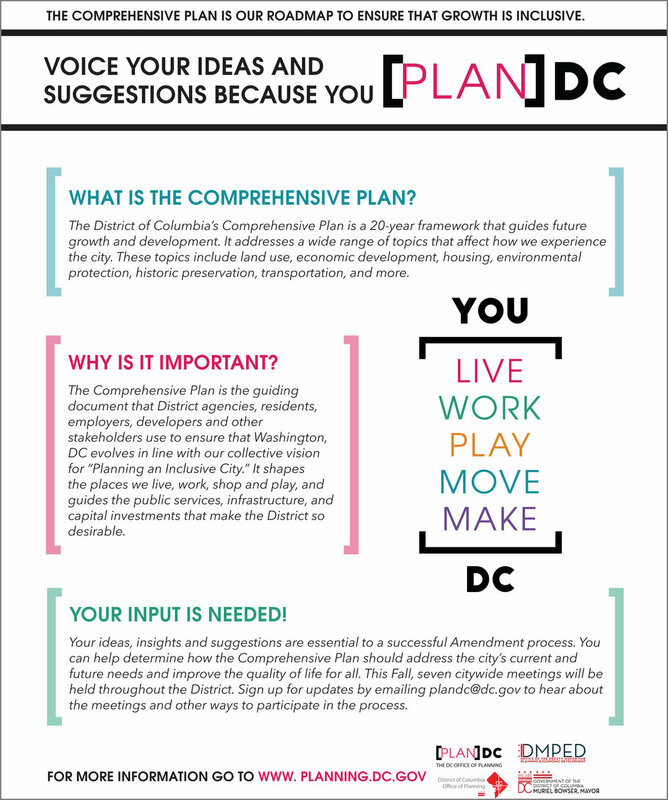 The DC Office of Planning (OP) is amending the District’s Comprehensive Plan, a 20-year framework that guides future growth and development in the city and shapes the places we live, work, shop, and play. OP launched the second amendment cycle to the Comprehensive Plan this year to ensure that the Plan remains responsive to the needs of the community. The project is expected to take approximately 18 months and will result in a final amendment package for submission to the DC Council for review and approval, followed by review and approval by the National Capitol Planning Commission and Congress. Your ideas are essential to a successful amendment process. Share your ideas in an online survey. The last of four opportunities to participate in a community meeting is scheduled for Monday, November 14, 6:30–8:30 pm, at Luke C. Moore High School, 1001 Monroe Street NE (nearest Metro: Brookland). Please RSVP. For more details about the Comprehensive Plan, Area Elements and the Amendment Process, please visit http://plandc.dc.gov/ and sign up for alerts. Since the Comprehensive Plan is a 20-year plan, the Plan uses Area Elements instead of Wards since Ward boundaries can change every ten years.